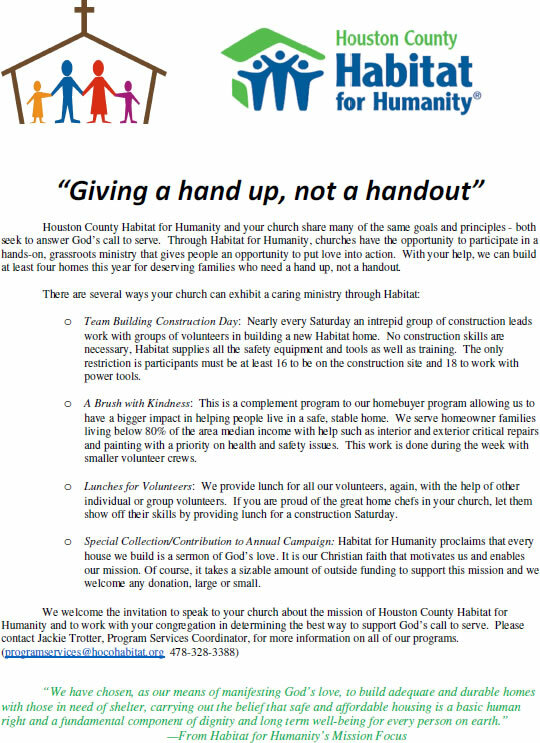 Houston County Habitat for Humanity is a Christian organization whose work is based on the conviction that to follow the teachings of Jesus Christ we must reflect Christ's love in our own lives by loving and caring for one another. Although we are a Christian organization, we partner with groups of diverse faith backgrounds to build houses for people in need. HoCo Habitat chooses its partner families based on need and ability to pay, not religious affiliation, and has served families with various faith backgrounds. There are a variety of other opportunities available to faith groups. To find out more information please contact Bill Goggin at 478.328.3388 ext 4. We are grateful to the faith groups who live out their faith in service. 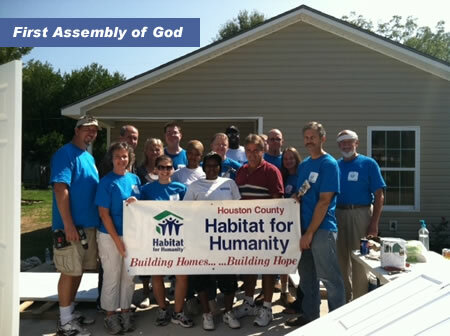 As a Christian organization, Houston County Habitat operates in the belief that we serve God best when we serve others.